Follow Steve, Lars, Thora, and Captain Fuzzy as they look for adventure and treasures on The Wild Sea, deal with other animal tribes like the Ninja Hamsters, Pirate Pigs, and more. Created by me, Noah B. Wilson, The Viking Bunnies aims to be an original cartoon series to be distributed over the internet on a monthly (and hopefully one day even faster) basis, created with the hopes of one one day even landing on Netflix or something similar. The series is about four "Farm Bunnies" who decided to build a boat and become vikings despite having no real knowledge of what that means. Equipped with their boat The Bunny Ship and some makeshift viking armor and weapons, Steve, Lars, Thora, and Captain Fuzzy set out in search of treasures, adventures, discoveries, and fame. While a kid-friendly cartoon, The Viking Bunnies is not meant only for children as it parodies tons of pop culture icons such as Scooby Doo, The A-Team, Ghostbusters, The Legend of Zelda, and more, not to mention the very thin fourth wall that The Viking Bunnies typically break. In addition to their animated adventures, The Viking Bunnies is also an iPhone App / Adventure Game which users can play as Steve, Lars, Thora, or Captain Fuzzy as they dig deeper into the world of the Animal Kingdoms, enjoy new animated sequences, full voice acting, and revisit every town, island, or landmark mentioned in the cartoon. The Viking Bunnies App will get separate episodes of its own as new cartoon episodes are released, allowing those who play the game to get new islands, towns, and adventure areas to explore. There are top scores, monthly contests to see who the top vikings are, and even player-to-player competitions. The Viking Bunnies App is more than just a game: it is a playable simulation of the world of The Viking Bunnies, The Wild Sea, and all of the Animal Kingdoms. This is a labor of love and an attempt to get something new, interactive, and unique into pop culture. Your support helps fuel The Viking Bunnies on their quest into the spotlight as they hope to get that fame they are constantly searching for on their animated adventures (how meta). 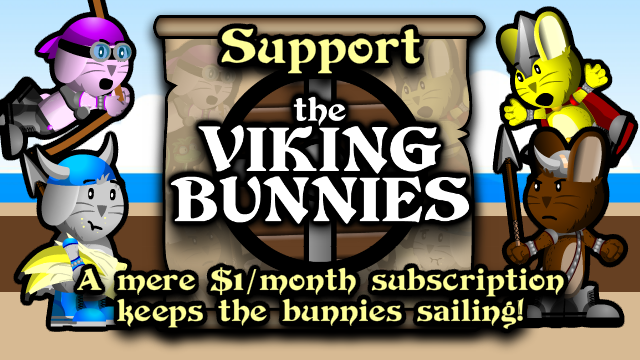 All The Viking Bunnies ask for is a mere $12/year. Think about that for a second: $12/year. That's all The Viking Bunnies ask from you to keep them moving along, and hopefully put some extra wind in their sails. When you really think about it, it's not that much at all, but it means the world to us. This is a small, 2-person operation, so any support you can offer is very much appreciated. Won't you help The Viking Bunnies out? And for those who have helped, please know we will never stop thanking you and hope to one day make you proud. We are on a quest to give something new to pop culture and battle our way through the constant drudge of recycled cartoons and programs. We're trying to be different and unique and be a 'breath of fresh air' in media, and you're helping us do just that. Thank you thank you thank you.